Have we seen the peak of hog prices for 2018? Ron Plain looks at key factors impacting prices, and margins. The odds are increasing that the annual high in hog prices is behind us. Late June and early July is the most likely time for the yearly peak in hog prices. There are factors such as a surge in pork exports that could yet boost prices above the late June peak, but the odds grow longer each week. Daily hog slaughter typically increases as we move away from Independence Day. Certainly, the June Hogs & Pigs report implied that increased slaughter lies ahead. The inventory of market hogs on June 1 weighing 180 pounds or more was up 2.4% and the hog inventory weighing 120-179 pounds was up 4.0%. The June report implied summer market hog slaughter will be up 3.3% year-over-year and fall slaughter will be up 3.5%. USDA’s Hogs and Pigs report has an excellent record in recent quarters on their market hog inventory estimates. 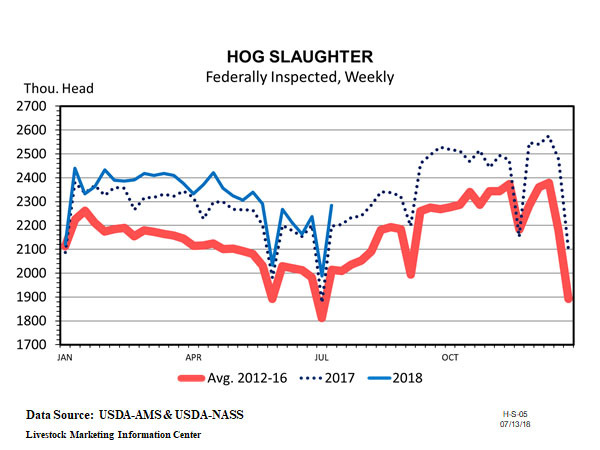 March-May hog slaughter was up 3.4% which is exactly what USDA’s March inventory survey predicted. The June Hogs and Pigs report said that the inventory of market hogs weighing 180 pounds or more on June 1 was up 2.4%. 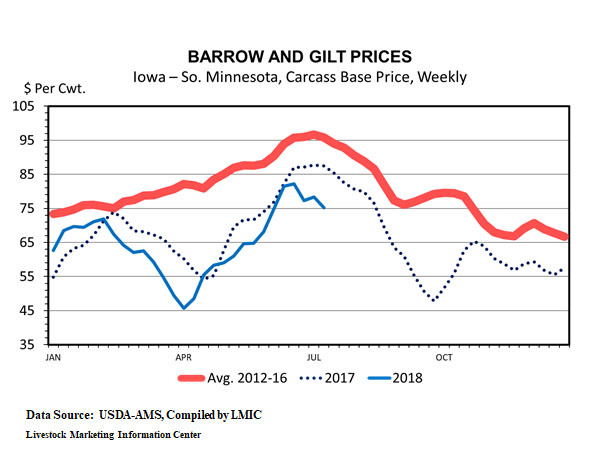 Since that date, barrow and gilt slaughter has been up 2.5%. The 120-179 pound market hog group was up 4.0% on June 1 which should match up with barrow and gilt slaughter during the next six weeks. The July 9 weekly crop progress report said 75% of corn acres were in good or excellent condition. That is 10 points higher than the same week last year, and last year’s corn harvest produced a record 176.6 bushels per acre. USDA’s July World Agriculture Supply and Demand Estimates report forecast this fall’s corn harvest to be 1.4% larger than their June prediction thanks to 1.1 million more corn acres planted than earlier expected. This month’s report is predicting the 2018-19 marketing year corn price will average between $3.30 and $4.30 per bushel. 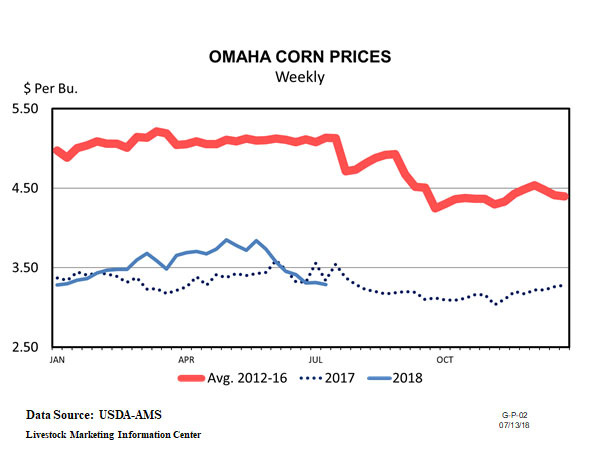 That is a dime lower price for the September-August marketing year than their previous forecast, but 40 cents higher than their corn price forecast for the 2017-18 crop year. The July WASDE predicted 0.7% more soybeans thanks to 0.6 million more acres planted. USDA is now predicting a 75 cent lower soybean price and $15/ton lower soybean meal price than the June WASDE. The July USDA forecasts have 2018 pork production up 4.5% from the 2017 record and 2019 pork production up 3.6% from the impending 2018 record. USDA increased their prediction of 2018 hog prices by $1/cwt (live) to $45.50/cwt, but lowered their hog price forecast midpoint for 2019 by $1.50/cwt to $42/cwt. 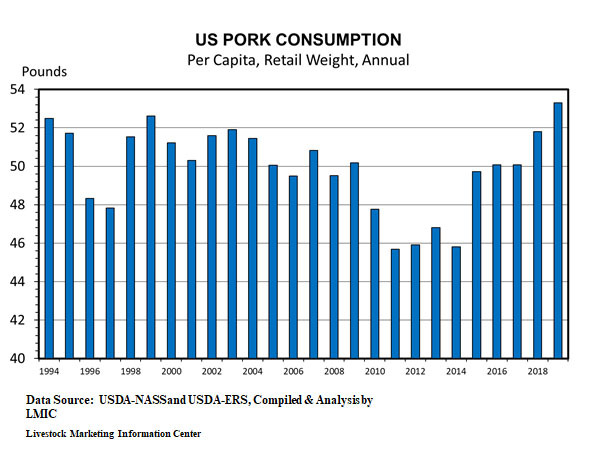 Compared to last month, the July WASDE has 0.1 pound more pork per person in 2018 and 0.2 pound more pork in 2019 making 2018 per capita supply the highest since 2003 and 2019 the highest since 1981. The total meat supply is quite large. USDA has set their forecast of 2018 red meat and poultry production at 103 billion pounds, up 2.9% from 2017 and 105 billion pounds in 2019, up 2.3% from 2018. On a per capita basis: 220.7 pounds per person in 2018 is the most since 2007 and 224.1 pounds per person in 2019 is a new record. Thru last week, 2018 packer margins are down more than $10 per head. This is not surprising given the increased slaughter capacity. 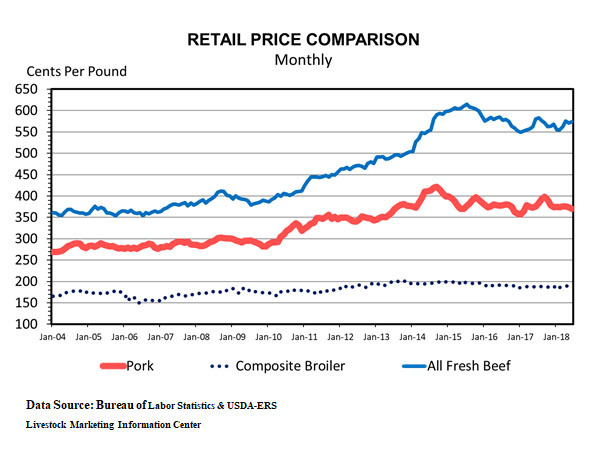 The average price for pork in grocery stores during June was $3.697 per pound, down 4.4 cents from the month before and down 5.9 cents from a year earlier. Despite lower retail pork prices than in May, tighter margins for distributors and retailers allowed the June average live price for 51-52% lean hogs to increase $10.13/cwt from May to $56.99/cwt. That was the highest monthly hog price since last August. Packer margins were up 8.7 cents per pound in June, but the wholesale-retail price spread was down 31.4 cents per retail pound compared to May 2018. 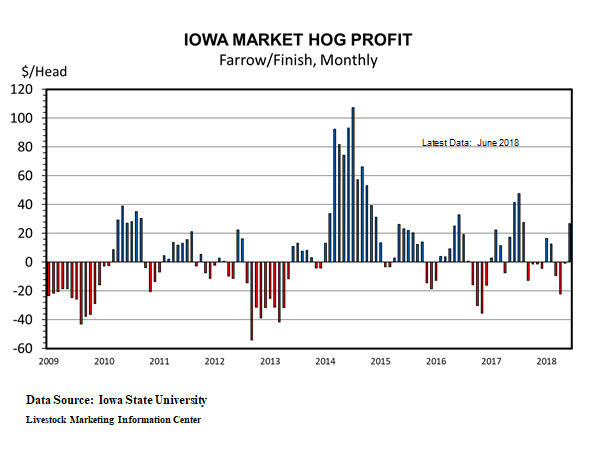 Lee Schulz at Iowa State University estimated farrow to finish profits for June to be $26.66 per head marketed, up sharply from a loss of 80 cents per head in May. June was the most profitable month for hog producers since August 2017. Dr. Schulz estimates the breakeven price for June at $47.73/cwt live or $63.64/cwt carcass. That is the highest monthly cost since August 2015. Cost of production is likely to decline as we approach harvest. The June Hogs and Pigs report indicated a modest slowing of herd growth. Farrowing intentions for both June-August and September-November were for a 1.6% increase. That is the smallest increase for any quarter since March-May 2017. Unfortunately, slower growth is not likely to sustain profits when production is at record levels. On Thursday afternoon, July 19, USDA will release its monthly Livestock Slaughter report. Preliminary data indicate June hog slaughter was down 2.6%. June 2018 had one slaughter day less than last year. On a daily basis, June hog slaughter was up roughly 1.8%. The July Cattle on Feed report will be released on Friday afternoon as will the semi-annual cattle inventory report. The Cattle on Feed report will give insight to beef supplies in the second half of 2018. The Cattle inventory report will give insight as to 2019 and 2020 beef supplies.